Cop Identified in Scott Olsen Incident? Scott Olsen was seriously injured on October 25. 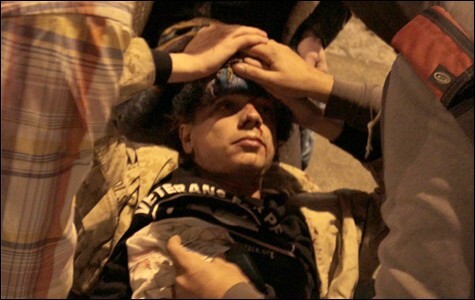 One of the most indelible images of the Occupy movement to date is that of Marine veteran Scott Olsen being carried away from a skirmish line of riot police at 14th Street and Broadway on October 25 in Oakland. 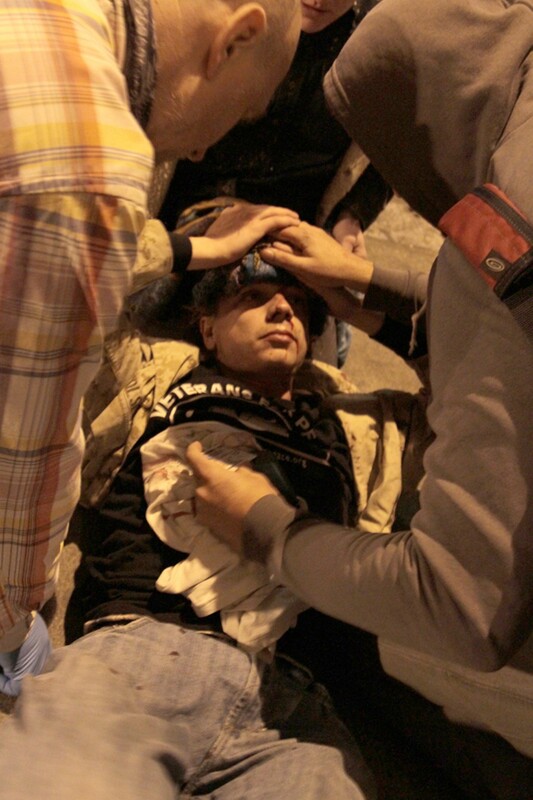 Stunned and bleeding from an ugly gash on his forehead, the 24-year-old Wisconsin native had been struck in the head by an unknown projectile during the first salvo of tear gas, flash-bang grenades, and less-than-lethal munitions fired at hundreds of Occupy Oakland supporters facing off against Oakland police and several other Bay Area law enforcement agencies called in on mutual aid. Video from the tear gas-soaked night of the 25th shows a prone Olsen lying in front of metal barricades and police in riot gear. As several protesters ran to Olsen's aid, someone from the cluster of police appears to lob a flash-bang grenade into the crowd gathered around the young veteran. The stun grenade explodes amid a cloud of tear gas and deafening noise, scattering Olsen's rescuers. The footage of the flash-bang grenade exploding practically on top of Olsen and his rescuers, as well as dramatic video of a stunned and bloody Olsen being carried away from the intersection, went viral within hours, propelling Occupy Oakland to international attention and setting the stage for the November 2nd General Strike. In the weeks and months afterward, rumors and accusations flew about the identity of the officer who fired the projectile that wounded Olsen, and the one who threw the concussion grenade on top of him. Rumors circulated on the Internet that either a San Francisco sheriff's deputy or an officer from the Palo Alto Police Department was responsible. Members of Anonymous even went so far as to publish pictures and the personal information of a San Francisco sheriff's deputy they believe tossed the stun grenade at Olsen. But an extensive review of video footage and Oakland Police Department records by this reporter indicates that Robert Roche, an acting sergeant in the Oakland Police Department and member of OPD's "Tango Teams," threw the flash-bang at Olsen and his rescuers. It's also not the first time that Roche's actions have come under scrutiny. Police records show that Roche had previously killed three people in the line of duty. In one clip of footage shot on October 25 by KTVU, the camera zooms in on a helmeted, gas-mask wearing officer in OPD insignia pointing a shotgun at the crowd. Olsen's inert body is also visible in front of the barriers. Another video clip shows the same officer training his shotgun on the crowd, lowering the firearm as a crowd gathers around Olsen, and stepping back behind a line of San Francisco sheriff's deputies on the barricade line. A grenade is then tossed at Olsen's body as rescuers arrive. According to former San Francisco Sheriff Mike Hennessey and Sergeant Kara Apple, a Palo Alto Police spokeswoman, officers from neither agency were equipped with less-than-lethal shotguns or flash-bang grenades that night. A list of OPD crowd-control munitions published by Al Jazeera last year includes the Remington Model 870 shotgun and two types of CS or pepper spray-loaded blast grenades. Two stripes and a star, OPD's insignia for acting sergeants, are visible on the officer's left sleeve. In both clips, the officer is holding his shotgun with his right hand on the trigger, his helmet visor is up and the numbers "35" are visible on his helmet. According to an OPD roster of the three-digit helmet numbers assigned to individual officers and the personnel detail for October 25, Officer Robert Roche is the only one with a helmet number beginning with "35" who was assigned to a Tango Team that night. Roche's helmet number that night was "357," according to OPD records. Three attorneys who reviewed the two clips mentioned above concur that the shotgun-wielding officer is the same in both clips. "From the positioning of that officer in the line and his weapon, it appears it was likely the same cop who tossed the grenade at the medics trying to help Scott Olsen," said R. Michael Flynn, president of the San Francisco Chapter of the National Lawyers Guild. Jim Chanin, one of the two attorneys who have overseen OPD's federal consent decree since 2003, concurred. "His movements and appearance strongly suggest that it's the same officer that threw the grenade," Chanin said. Chanin also observed that the officer's helmet number began with "35." Rachel Lederman, another NLG-affiliated attorney, also believes the officer is the same and identifiable by the "35" on his helmet. Lederman characterized the officer's actions as "illegal" and "evil." Tossing a flash-bang grenade into a crowd and at a wounded person is "not only improper under [OPD's] crowd control policy — the guy should be fired," Lederman said. Sergeant Chris Bolton, chief of staff to Police Chief Howard Jordan, said the investigation into the Olsen incident is ongoing. "Any known or alleged uses of force against Mr. Olsen are assigned to an independent investigator," Bolton said in a statement. "Based on available video, photographs, and reports, the department has identified several officers that they are subjects of those open investigations." Bolton added, however, that "no investigative findings or discipline have been announced or imposed." Roche is a rifle officer who has also served in gang enforcement units. He has been involved in three fatal shootings during his career. In 2006, he fatally shot seventeen-year-old Ronald Brazier after the teenager fired on Roche and two other officers. In 2007, Roche shot and killed an unarmed Jeremiah Dye in a crawlspace under an East Oakland house. Dye had run from police after his cousin shot and wounded an OPD officer during a traffic stop. In March 2008, fifteen-year-old Jose Buenrostro was shot to death by Roche and two other officers while in possession of a sawed-off rifle on 79th Avenue in East Oakland. Buenrostro's family received a $500,000 wrongful death settlement from the City of Oakland in 2010, even though police claimed that Buenrostro pointed the weapon at them. Buenrostro's family contended that he did not threaten the officers. Alameda County District Attorney's Office records indicate that Roche was cleared of criminal conduct in both the Brazier and Dye shootings. Roche and Sergeant Ronald Holmgren, who supervised Tango Team 2 during the October 25 crowd control actions, were not assigned to the Tango detail on the evening of the November 2 General Strike, according to Oakland Police Department records. However, Roche was photographed on the street during a January 14 Occupy Oakland demonstration. OPD's "Tango teams," or tactical teams, have been at the heart of some of the most intense clashes of the Occupy Oakland movement (see "Oakland Used Violent Cops Against Occupy," 12/21/2012). Aside from the Olsen incident, video from the evening of the November 2 General Strike shows an unidentified OPD officer wearing a rucksack emblazoned with "Tango Team" striking US Army veteran Kayvan Sabeghi with a baton. Sabeghi was later hospitalized for a ruptured spleen. Jacob Crawford contributed to this report. Correction: The original version of this story misidentified the type of shotgun used by OPD, according to Al Jazeera. It was a Remington Model 870, not a .357. Also, Acting Sergeant Roche was photographed at a January 14 Occupy Oakland demonstration, not on January 28.